Recently, I’ve been experimenting more with the process of dyeing fabric and thought I’d share some of my latest works with textile design. While experimenting with dyes I’ve been practicing how to make dyes as well as different dyeing techniques. I started out with basic techniques, similar to those of tye dyeing. I utilized objects like marbles, bottle caps, and rubber bands to experiment with the different patterns I could produce. 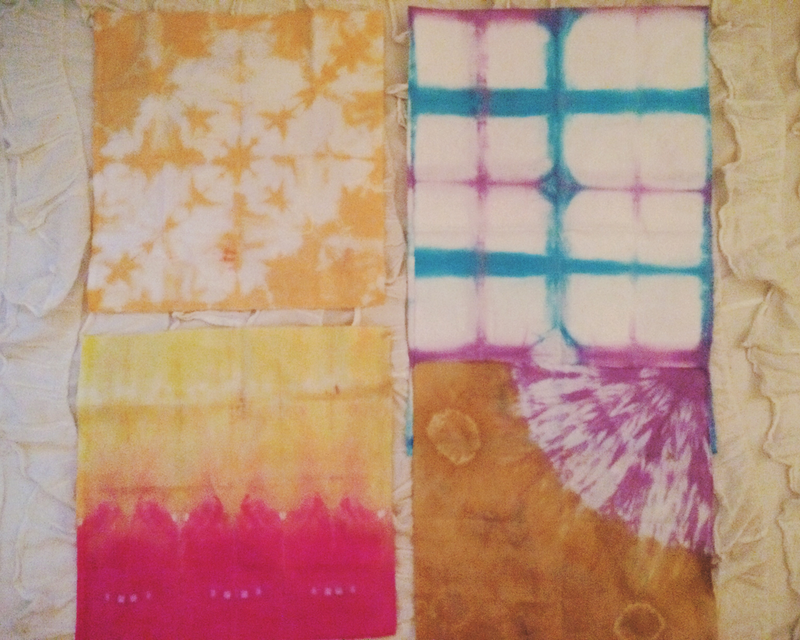 After mastering that, I went on to understand more of the science of dyeing and started practicing more complicated techniques like shibori, utilizing a tube and some think thread, and then hand stitched shibori in the form of lines, circles, and shapes. Shibori is an interesting dyeing technique from Japan that creates intense patterns in the fabric. In order to produce a successful shibori piece, you must sew patterns in the fabric you’re using, and then pull the thread extremely tight through the fabric before dyeing. After understanding different techniques like this, I went on to start over dyeing fabrics I had already dyed with different techniques, and discharging parts of fabrics that I wanted to take color out of. I then conceived of a larger piece inspired by the autumn to winter transition of the seasons where I first put the fabric on a tube and used thick thread to create a shibori as the base. After this, I over dyed the right side of the piece just by squirting different dyes onto the fabric and moving it around with my hands. 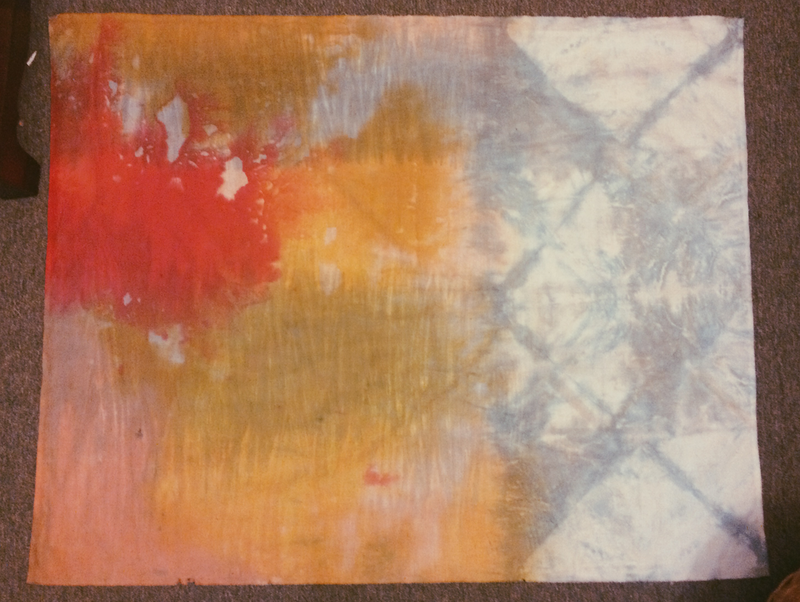 I really like this technique––even though it’s simple––as it creates the illusion that the end product looks more like a painting than a dye piece. Paintings influence my ideas for dyeing greatly. After this, I accordion folded the right side of the piece in a triangle and let that sit in a blue dye bath, composed of blue dye, water, and soda ash. After that dried, I put a triangle shape over the accordion fold and discharged the edges so there would be no dye there. Then, I over dyed the discharged part with a brown dye I made by mixing the primary dye colors together. The brown is meant to resemble bare branches, and the blue is meant to represent snowflakes. 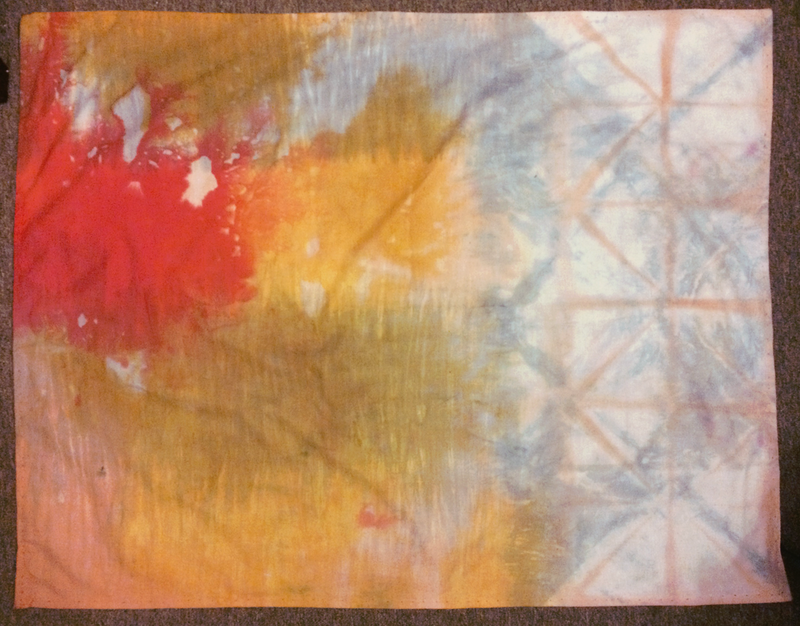 The shibori as the base on the Autumn side also reminds me of a forest with the lines it produces in the fabric. Right now I’m experimenting on bleached cotton as it produces the best colors. All fabrics must be washed and soaked in soda ash before going through the dyeing process, as the soda ash is what produces the chemical reaction with the dye to be successful. There are also some alternatives to soaking in the soda ash for at least 15 minutes before dyeing. One alternative is creating a dye bath consisting of about 3-4 tables of dye concentrate, about a quarter cup of water, and 3 tablespoons of soda ash. This mixture also creates a chemical reaction when soaking on the fabric. 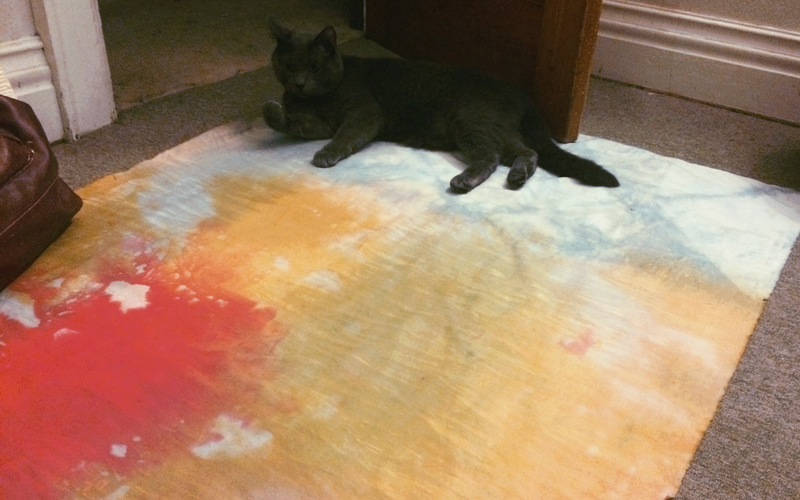 Another alternative (that I utilized in my larger piece) is putting the dye concentrate, soda ash, and water in a squirt bottle and mixing it around in there before squirting onto the fabric. After dyeing the fabric by squirting dye onto the fabric, I let the fabric soak for about 45 minutes before washing the excess dye off of the fabric. If your dye is in a dye bath, the piece can soak in the dye bath for about 45 minutes as well. You can soak the fabric for less than that time or more than that time depending on how strong you want your color to come out. After waiting for your dye, you must wash out your piece: first in cold water, then in a bath of hot water with a little soap for at least 5 minutes, and then one final rinse in cold water. After completing all these steps your dye piece is ready to dry!